Manatees are returning to their summer haunts along the coast of South Carolina, and S.C. Department of Natural Resources biologists are reminding coastal residents and visitors to avoid harmful interactions with these endangered animals and report sightings online. This year, S.C. Department of Natural Resources (DNR) biologists and partners will be keeping close tabs on one manatee in particular. In December 2015, a large, multi-agency team successfully rescued a male manatee suffering from cold stress in the Cooper River, near Charleston. That animal, nicknamed Goose, was rehabilitated at SeaWorld Orlando and later released in Florida with a radio transmitter tag that has allowed researchers to track his movement. Now, Goose has migrated back to South Carolina, and coastal residents and visitors can help DNR, the U.S. Fish and Wildlife Service, and Sea to Shore Alliance learn more about Goose and his species by reporting all manatee sightings. Submit your sightings and photographs of live manatees online here. Please note the date, time, location and number of manatees seen, as well as the coordinates, if possible. Photographs of scars on manatees' backs and tails are useful, because they can often be used to identify previously known individuals – however, manatees should never be approached by boat to obtain pictures. 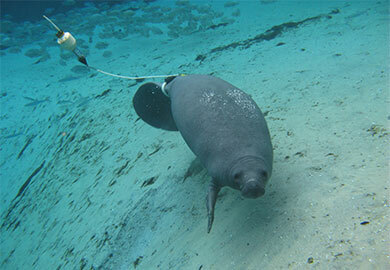 Goose and other manatees fitted with radio transmitter tags have what looks like a belt attached around their tail. These trailing tags are harmless to the animals and are designed to break free or eventually fall off. Report an injured or dead manatee by calling the DNR hotline at 1-800-922-5431. In addition to reporting sightings, coastal residents and visitors can help manatees by staying alert while on the water and avoiding harmful interactions with the animals. "Feeding and watering manatees is illegal and encourages the mammals to spend time at docks and marinas, making them susceptible to boat strikes, which is one of the main causes of mortality for manatees," said DNR veterinarian Al Segars. With an estimated population of only 6,000 animals in U.S. waters, manatees, also known as sea cows, are protected as an endangered species under federal and South Carolina law. Dangers to the species include boat strikes, entanglement in fishing gear and harmful algal blooms known as red tides. Collisions between boaters and manatees are more likely to occur in shallow waters, particularly around docks and at the edge of marshes where manatees feed. Following boater safety regulations in these areas can reduce the risk of a collision. Boaters should also watch for manatee backs, tails, snouts and "footprints"—a series of round swirls on the surface caused by a swimming manatee’s tail. If a boat accidentally collides with a manatee, the DNR asks that the boater stand by and immediately contact the U.S. Coast Guard on VHF Channel 16 or DNR at (800) 922-5431. Doing so provides biologists the best chance to help the animal and gather valuable scientific data. Although Florida manatees are present throughout the year in Florida, they are migratory in South Carolina. Manatees begin their slow migration up the South Carolina coast each spring when water temperatures rise into the upper 60s. They can be found in tidal rivers, estuaries and nearshore marine waters throughout Georgia and the Carolinas throughout the summer months. Manatees return to Florida in September and October as the water temperature cools. Sustained exposure to temperatures lower than 68 degrees Fahrenheit can cause cold stress and even death in manatees. Adult manatees are about 10 feet long and weigh up to one ton. Their skin varies from gray to brown, and their bodies are rounded with two pectoral flippers and a wide, flat tail. Subsisting on marsh grass and other aquatic plants, the animals are gentle and pose no threat to humans. It is illegal to hunt, play with or harass manatees; this includes touching, watering or attempting to feed them. Manatees have a slow reproductive rate. Females are not sexually mature until about 5 years old, and males mature at about 9 years of age. On average, an adult female gives birth to one calf every two to five years, and twins are rare. The gestation period is about a year. Mothers nurse their young for one to two years, so a calf may remain dependent on its mother during that time. Manatee calves are about 4 feet long at birth and about 60 pounds. Look around for manatees before cranking your boat's motor. Use caution when navigating in shallow water and along the edge of a marsh. Manatees cannot dive away from boats in these areas. Please heed "slow speed," "no wake" and manatee warning signs, especially around docks. Wear polarized sunglasses to reduce glare, making it easier to spot manatees below the surface. Watch for large swirls in the water, called footprints, that may be caused by manatees diving away from the boat. Dock owners should never feed manatees or give them fresh water. This could teach the animals to approach docks, putting them at greater risk of a boat strike, and it is illegal. Never pursue, harass or play with manatees. It is bad for the manatees and is illegal.